We know human activities lead to a lot of untimely bird death and are causing an acceleration in extinction rates. In this series of posts, “Killing Birds,” I examine the mechanics of anthropogenic bird death. How are we killing these feathered creatures that we, oh, so love? Last spring I wrote about the threat of a specific invader on birds, the domestic cat. While the impact of invasive cats on birds is staggering, in reality there exists a suite of invaders that have wrought havoc on bird populations globally. Rats, weasels, snakes and other nest predators are one notorious example. These invaders cause the most havoc on Islands, where birds often lack an evolutionary history with mammals and snakes. This post is inspired by a recent trip to one hyper-susceptible island chain, Hawaii, where I witnessed an ongoing bird holocaust. Hawaii’s volcanic emergence from the floor of the Pacific Ocean created a new land devoid of fauna. Only species able to survive a serendipitous immigration across some 3000 miles of open ocean earned a foothold on the rich volcanic soil of the archipelago. The distance from continental species sources is so vast, that surviving such a journey to breed and establish was a rare occurrence even for birds. It only happened about a dozen times in the 5 million years since Kauai, the oldest of the main islands in the chain, emerged. The few song birds that arrived found a lush tropical island with abundant food for the taking. Like Darwin’s famous finches of the Galapagos Islands they evolved into different species on different islands and bill shapes shifted rapidly to take advantage of untapped food resources. Though unlike the dull brown Galapagos birds, the Hawaiian finches developed a dazzling array of yellow, red and black plumages. Some evolved long sickle-shaped bills for drinking flower nectar along with festive crests that transport pollen. Many Hawaiian birds may have gone extinct during the Polynesian settlement of the islands some 1700 years ago, and thus missed their chance for modern scientific description. But since the arrival of European and Asian colonists, two-thirds of Hawaii’s unique endemic terrestrial avifauna has gone extinct. The main cause? Invasive species. Human-associated mammal and plant companions: rats, pigs, goats, grasses, have done the bulk of the damage. Direct effects, such as predation on eggs and nestlings have synergized with the indirect effects of native vegetation being almost completely replaced by exotics. Loss of native vegetation is particularly problematic for nectar-dependent bird species. On the most developed of the islands, Oahu, less than 10% of the original native forest cover remains. Oahu’s beauty, world-renowned surfing and military bases have attracted throngs of immigrants and tourists. Development sprawls up the valleys like a reverse lava flow pushing the remaining native ecosystems further and further back. Natalia and I travelled to this ecological hell-scape, ironically enough, to present at a conservation biology conference. We made time to go explore some of the forests to seek out the three (yeah there are only three!) remaining native bird species. Entering the forest in morning, Natalia and I were greeted by a pleasant dawn song composed of White-rumped Shamas, Red-vented Bulbuls and Red-billed Leiothrix (all south Asia species) before we made the exciting find of a Northern Cardinal, the most common and conspicuous backyard bird found in Durham, NC. These birds were brought over as caged pets before escaping and proliferating. Indeed Oahu, down to the heart of Honolulu, is bustling with bird life, just none of it is native. 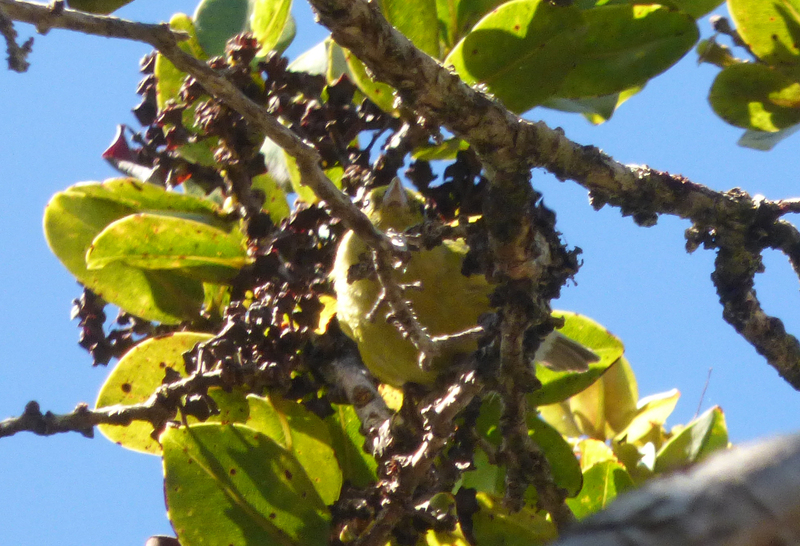 After seeing about 50 Japanese White-eyes and one feral pig we finally found our target, a single young Oahu Elepaio. As they are known to do, this bird came in inquisitively close to check us out, but it didn’t stay long and it was raining so my camera was packed away. 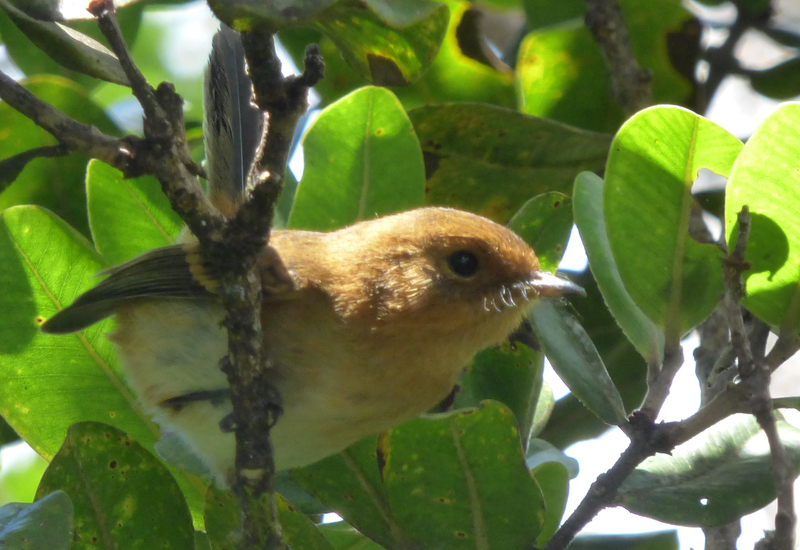 The problem for native birds, like the Elepaio, isn’t just that all the exotics are out-competing them, the invaders also carry with them foreign parasites and diseases to which the Hawaiian birds have no resistance. Much like the small pox that is thought to have wiped out some 90 percent of the Native North Americans during the early part of European colonization, Avian malaria has been ravaging endangered native bird populations already reeling from other new pressures. After the end of our conference Natalia and I traveled to Kauai, which is relatively underpopulated and retains much more forest than Oahu. We focused our birding effort in Alakai Swamp, an area known as the ‘Lost World’ for containing the last known populations of many unique native Hawaiian birds. Avian malaria has already extirpated many of these birds, such as the Ou; many of the others that persist are on the way out. After hiking 12 hours up and down the muddy slopes of the dilapidated trail system we failed to encounter the three rarest species: the Akikiki, the Akekee and the Puaihio. The birds are declining so quickly in this area that even relatively recent accounts are outdated and inaccurate. We were told the iconic Iiwi, a poster child for Hawaii, would be common here, but we caught a glimpse of just a single immature bird deep in the swamp. The Anianiau and Kauai Amakihi were also supposed to be ubiquitous and we saw just a single pair of each. Most of the trail was lined with invasive ginger plants and whenever I took a step off the trail to relieve myself there always seemed to be a rat scurrying around. Hawaii’s “lost world” seemed all but lost. We had a similar experience on Maui. We made a special effort to visit the Nature Conservancy’s Waikamoi Preserve, which required advanced reservations and is only open to the public once per week. 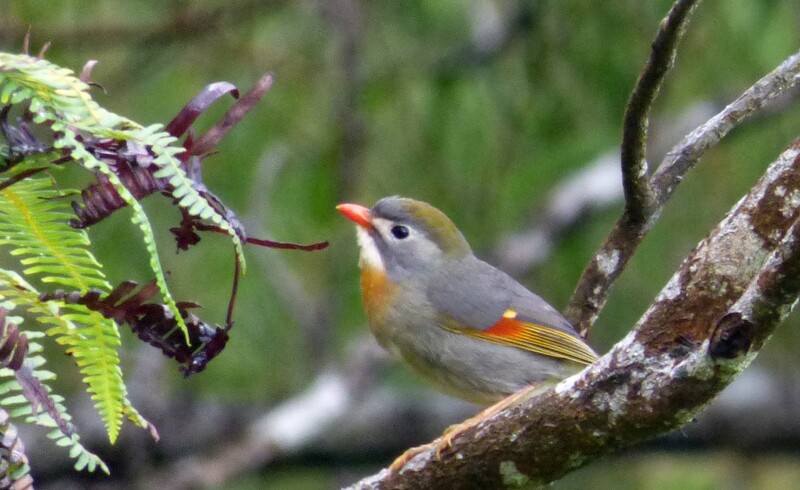 It was featured recently in The Nature Conservancy magazine, which described the birding as “unparalleled.” We were hoping to see the Maui Parrotbill and Akohekohe on the bird loop, but our guide instead took us through a forest of exotic pine trees filled with introduced House Sparrows and House Finches. The native birds we saw on the hike were easily seen in the parking lot; the reserve and guided tour were a huge disappointment. Invasive species have absolutely wrecked Hawaii’s native ecosystems and despite best efforts of committed conservation groups the native birds and plants are rapidly being lost. 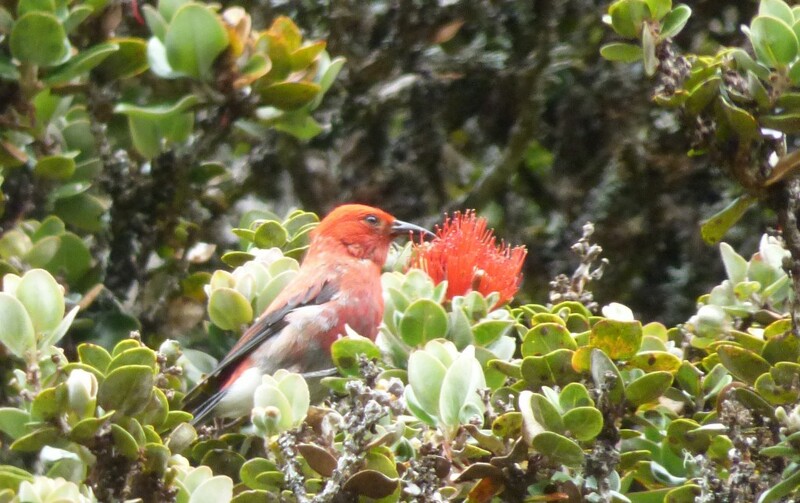 Out of all the native “Hawaiian Honeycreepers,” as the finches are called, it appears that just a couple have made it through the bottleneck: the common and widespread Apapane, and the Oahu Amakihi, which we found thriving in an exotic eucalyptus forest. I would have loved to see these islands 100 years ago, before they were overrun by all the continental invaders. Or conversely, it would be interesting to be able to fast-forward 100,000 years to see how the potpourri of introduced birds has been molded while under genetic isolation from source populations. 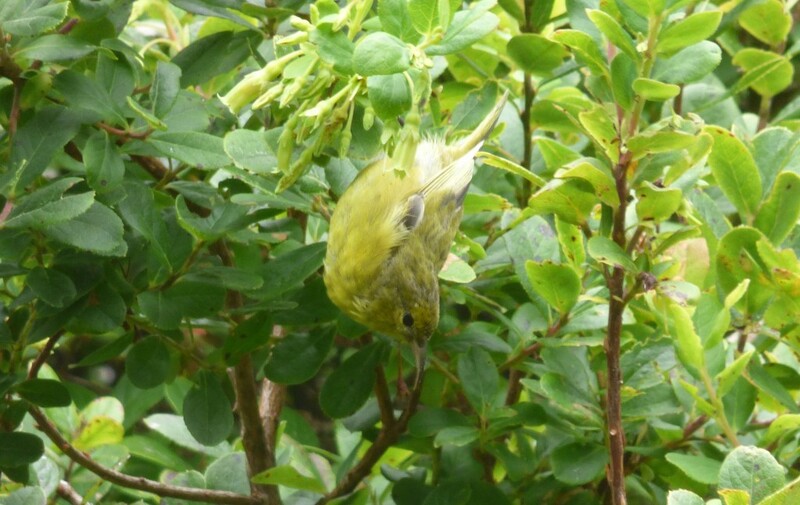 But to visit and bird Hawaii is essentially a masochistic exercise for an ecologist. My advice is to spend as much time underwater as possible. There are invasive grouper and starfish there too, but compared to the Hawaiian forests, the reefs look downright resilient.